Nick Lemann reviews Our Kids: The American Dream in Crisis by Robert D. Putnam. At the descriptive level, Putnam's conclusions seem very similar to those of Charles Murray in Coming Apart. Of course, description is much easier to obtain than causality. No other measure of parental affluence or family structure or neighborhood social capital (or indeed anything else we had measured)—none of the factors that this book has shown are so important in producing today’s opportunity gap—had any appreciable effect on college attendance or other educational attainment. No measure of parental resources adds any predictive power whatsoever—not parental occupational status, not parental unemployment, not family economic insecurity during high school, not homeownership, not neighborhood characteristics, and not family structure…. Parental education, parental encouragement, and class rank were all modestly predictive of extracurricular participation, but holding constant those variables, extracurricular participation itself was unrelated to college-going. So is it really the case that Putnam has shown that strong social capital once produced individual opportunity—let alone that the deterioration of social capital has produced what he calls the opportunity gap? The passages I just quoted seem to indicate that the strong association between social capital and opportunity that is Putnam’s core assertion has not been proven. Putnam doesn’t define “social capital” precisely enough to rigorously test its effects, even on as small and unrepresentative a sample as the one in his survey, and he doesn’t attempt to test its effects precisely in the present. It could even be that, rather than social capital generating prosperity, prosperity might generate social capital, which would mean Putnam has been showing us the effects of inequality, not the causes. 1. American society has become increasingly meritocratic in the last 50 years, with advancement more and more dependent on largely heritable attributes such as cognitive ability, conscientiousness, future time orientation, etc. Consequently, gaps between different SES groups have become more and more difficult to remediate. 2. External forces, such as automation and global economic competition, have placed a larger and larger premium on attributes such as those listed above, leaving Americans of below average ability at a severe disadvantage. The consequences of these observations are exacerbated by an increasingly winner take all economic system. If these points are correct, then Our Kids and Coming Apart are documenting consequences, not causes. See also Income, Wealth and IQ , US Economic Mobility and Random microworlds: the mystery of nonshared environment. I am curious about the claim about conscientiousness and future time orientation. Am I to understand that you are claiming that conscientiousness and future time orientation are largely heritable? By "largely heritable", do you mean merely that they are transmitted from parent to child (i.e through education etc.) or that they are transmitted from parent to child *physically* (i.e they are a genetic attribute). I have always thought that there was a significant cultural dimension to these attributes. Personality traits are harder to measure than cognitive ability. If one properly accounts for the additional noisiness in the measurements of personality traits, I believe the resulting heritability is similar to that for cognitive ability. 6) tax code changing the definition of taxable income and increasing compliance (especially w.r.t piketty and saez's work). In other words, the actual problem is generally much smaller in real terms if you think of it in terms of how most individuals compare to their parents or grandparents in objective/quantifiable terms . 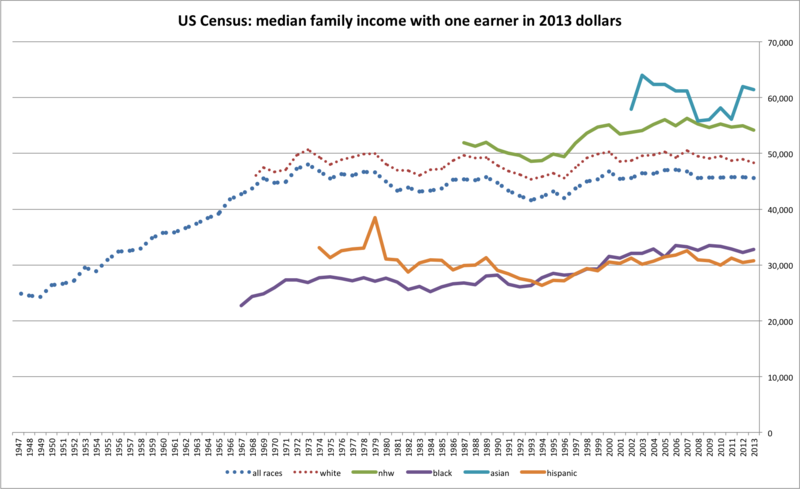 If you look at, say, median family income with by # of earners you can see the the median case, at least, is generally significantly better off than their statistical counterparts in earlier generations. That being said, I agree that those of significantly below average ability have stagnated (in real terms) and even lost some ground. Labor force participation rates have clearly dropped substantially in some communities and it's not just because they literally cannot find any work. I attribute this to a combination of factors, but mostly globalization, changing social norms, welfare systems (disability, food stamps, etc), and the general economic fact that people can earn enough to subsist at a basic level with relatively little effort (especially in low cost areas). Our Kids and Coming Apart are probably describing both the cause AND the effect. They are all interrelated. You are also forgetting the largely heritable attribute of wealth. Having recently counseled two kids from working class backgrounds who were accepted into very good colleges but had to go to lower quality schools due to the cost, I know that the hurdles are much higher now. When I went to college, you could go to a very good state school close to home and pay for it yourself by working part time, if needed. That is very hard to do now. The state schools provided a way up for a lot of working class kids whose kids can now afford to pay for private colleges. "American society has become increasingly meritocratic in the last 50 years"
You and (libertarian) Murray place too much faith in American meritocracy. The Cohen's d SAT gap between six-figure-income households and those below coincides with the economy's growth rate. Both declined significantly in 2008 and are still lower than 10 years ago. Thus, the "cognitive elite" has a tenuous hold on elite status. America still has an aristocracy, and sustained economic decline would purge the smart from the wealthy. One can trust the laws of physics, as with the greenhouse effect and its potential to ruin our economy in the long term. Murray resists this knowledge based on ideology, while his critics reproach his previous mention of incontrovertible racial IQ gaps. yeah that's it. that's the ticket. so Scandinavia and Germany and the Germanic language speaking countries ex-Anglos-Saxon countries just haven't experienced this meritocracy, but China and Latin America have. my great great great ... great grandfather was William Bradford. steve is the typical child of immigrant chinks. obedient, pushy, striving, vulgar...disgusting...ruining the country...chinkifying they country. but thanks for my genome! Great blog post , informative list. Thanks so much. I’m enjoying devouring your site!! The changes in the quality of schools available to lower SES children is certainly a factor in my country. The gap between schools seemed to be much smaller in the 1970's, perhaps owing to much greater rigor in the training for teachers. I believe that it is much harder for bright children from low SES to succeed now, because they are stuck in schools which have much higher numbers of children with serious problems - stemming from cognitive+personality factors which draw on genetics, epigenetics and the increasingly toxic and dis-functional culture they are raised in. Also, in Australia, private schools are well-known for pushing adolescents towards higher education, even if their cognitive ability may not quite be up to the standard required. Teachers in public schools often criticize this, and point to the superiority of the children from public schools who make it to university. Of course, the elite private schools send many more children as a percentage of total students, and the strategy has life-course benefits and reflects IQ trajectory across the life-span. Environment counts for more in adolescence than in later adulthood - so the private school student who is coached and pushed to study, and who takes 5 years to pass a three year degree, will still get into their profession, and will be achieving at higher level by age 50 maybe above what their age 50 IQ score might predict?